Totes come in so many sizes now its cheap and ez to find some that keep stuff dry and organized. Pic 1 is 2 that fit together over the v-drive. Pic 2 is a big tote behinf the observer seat with plenty of room to put towels and stuff on top. A big advantage of replacing the tanks with sacs is the storage room. 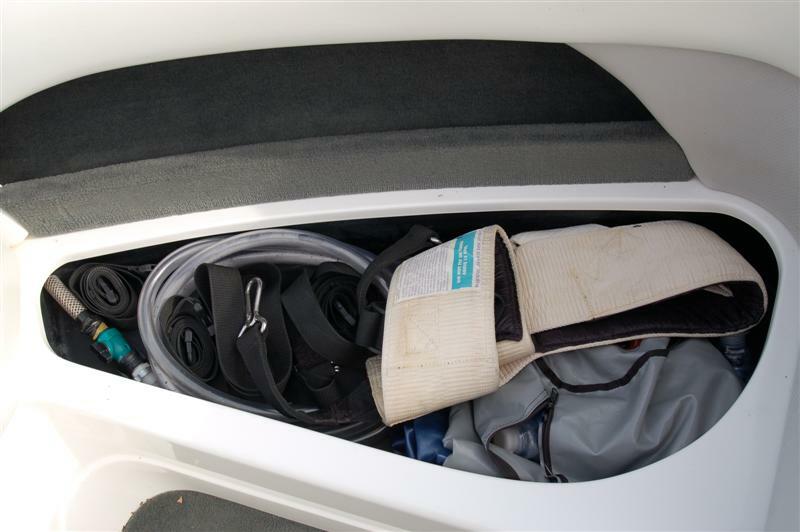 and plenty of room for some wetsuits in just 1 side of the trunks. 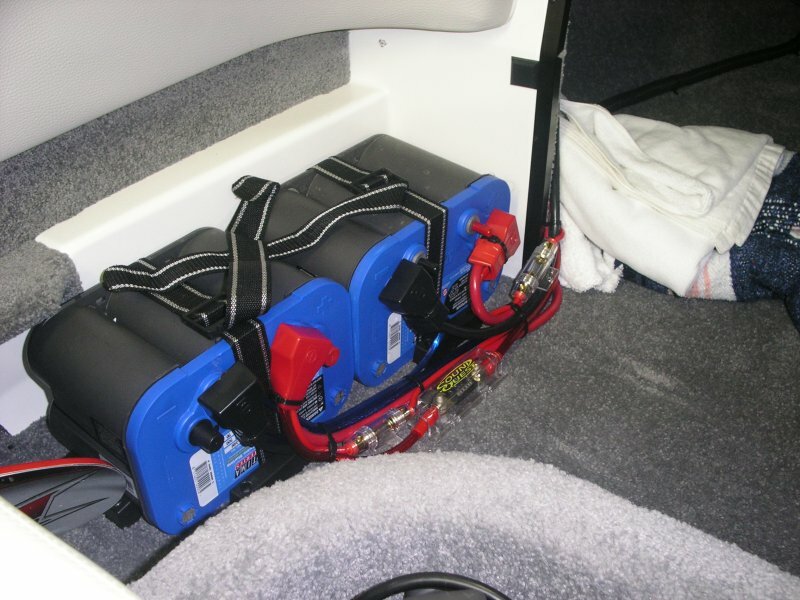 And the other wake enhancers - 2 empty 200lb sacs, fill hose, sling and straps in one of the bow ice chest. for keys and wallets. What size are they and how long do you think it will be before the bottom has a rub hole? For those of you with munchkins, some baby wipes come in plastic containers with lids that snap down. They're great for storage in the garage, boat, closet etc. Not watertight, obviously, but somewhat water resistant. I was thinking dock ropes and ski ropes so I was considering "venting" them anyway. They are 16qt sweater boxes. FWIW, the area under those seat cushions (on my boat) tend to get pretty wet due to people stepping in the boat from the sundeck. I wouldn't put keys and wallets in that one. Since I inspired you on the ballast thing... now you've gotta move your batteries! Look at all that wasted space behind the observer seat. Where'd you put the batteries? They're those blue thingies in the lower left of the picture. I actully like where the battery is, I dont know if much would be gained by putting it out there. in the storage locker, its out of the way, no kiddies are going to get to it. The only thing that bugs me about having it there is that stuff gets caught behind it & hides, making me have to crawl inside to find it. I moved my batteries to where Troy did & I like them much better in that spot. I hate having to pick that seat up anyway to get at whatever's underneath it, now we're going to convert it into a little tool & emergency stuff area. Troy, did you not have those batts on their side before? (in the new location) Maybe I was thinking of someone else. That's a great idea. As long as they fit under the seat. That was me. For whatever reason, my boat seems to have a little less clearance in that spot than Troy's, so I had to put them on their sides to get them to fit. It is the thick new carpet ... I don't have much clearance, maybe 3/16'ths or so, but that is enough. Thanks. Putting them on their sides made the wiring a little easier to clean up. I think that we're going to get a little carpet from Malibu & build some little walls on each end to keep stuff in that area, & also keep other stuff out. Would little cargo nets do the trick? Not sure how you would mount, so little walls covered in carpet is probably better. It does sound like a good idea to isolate that area. I would build the wall on the stern side of the batteries up against the batteries to keep as much space for skis etc. in that under-seat storage area. What do you need? I've probably got plenty left over that I can cut you a deal on. I got it online & cheap. Most high end stereo joints sell the wire, terminal ends, and fuses - do you have anything like that around Jonathan? Yeah, that's true, but it's spendy that way. JZ, I just checked & I've got a lot of 4 ga in both red & blue, but I ran out of the 8 ga. I do have a really good source for it, so let me know what you need & I'll send over the info.